Milos Sobajic was born in Belgrade in 1945. Graduated from Belgrade Academy of Arts in 1970. He has lived and worked in Paris since 1972. Mr Sobajic is a visiting professor at the Luixun Academy in Shenyang (China). He has been Dean and a professor of painting at Graduate School of Arts and Design within Megatrend University in Belgrade since 2005. 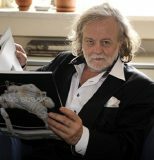 He has exhibited his works at more than four hundred group exhibitions in Serbia and abroad. Mr Sobajic has made numerous television films and featured programs both in Serbia and abroad, and bibliographic data about him include more than seven hundred texts. Los Angeles – Art-Expo-West, F.V. Gallery, Paris – Galerie du Dragon, Chicago – Art Chicago, Frank Pages Art Galerie, Belgrade – The National Museum, New York – Art New York, Frank Pages Art Galerie, Venezia – Bienalle di Venezia, Yugoslav Pavilion, Koblenz, Ludwig Museum im Deutschherren. Shenyang – Luxun Academy of Fine Arts. The works of Milos Sobajic have been displayed in many museums and public collections, which, among other, include the following: Fond National d’Art Contemporain, Paris, (France), The Macedonian Museum of Contemporary Art, Thessaloniki, (Greece), Miniatuur – Museum, Amsterdam, (Holland), Pinaquotheque National, Athens, (Greece), Musee d’Ixelles, Brussels, (Belgium), Fondatin Art Project, Geneva, (Switzerland), Bibliotheca Alexandrina, Alexandria, (Egypt), Collection Veranneman, (Belgium), Ludwig Muse – um, Koblenz, (Germany), Luxun Academy of Fines Art, Shenyang, (China), The Museum of Contemporary Art, Moscow, (Russia), etc. Fond National d’Art Contemporain, Paris, France; The Macedonian Museum of Contemporary Art, Thessaloniki, Greece; The Contemporary Art Center, Larissa, Greece; Miniatuur-Museum, Amsterdam, the Netherlands; The Museum of Contemporary Art, Belgrade, Serbia; The National Museum, Belgrade, Serbia; The Vojvodina Museum, Novi Sad, Serbia; The Modern Gallery and Museum, Cetinje, Montenegro; The Modern Gallery, Valjevo, Serbia; The Serbian People Institute Gallery, Sremski Karlovci, Serbia; The Cultural Centre, Niksic, Montenegro; Pinaquotheque Nationale, Athenes, Greece; Muzej na sovremenata umetnost, Skopje, Macedonia; Musee d’lxelles, Brussels, Belgium; Fondation Art Project, Geneva, Switzerland; Bibliotheca Alexandrina, Alexandria, Egypt; Artistic Brethren of Dobrunja Monastery, Visegrad, Republika Srpska; Artistic Brethren of Krka Monastery, Croatia; Collection Veranneman, Belgium; Ludwig Museum, Koblenz, Germany.